Just wanted to wish you a wonderful Thanksgiving day. I especially appreciate those who’ve stuck with me the last few weeks with the onslaught of holiday tutorials! It’s been fun, but I’m pooped! NOTE: the tag giveaway winners will be announced this Sunday – if you missed them be sure to go comment on them! 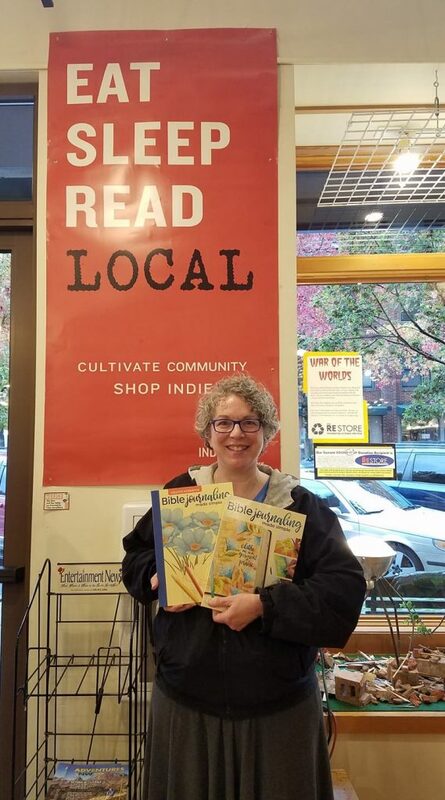 I was planning to post a giant “sales” post like usual today or tomorrow – but I’m just spent. It’s a time of year that those of us who do this for a living throw as many affiliate links at you as possible to beef up the income, but I’m going to just do a minipost. I encourage you to revisit the Gift Guide if you want a few shopping ideas. Charitable Tuesday – give give give! For those who’ve emailed to ask how you can support me with your shopping—below are my affiliate shops and what little I know of their coming sales. If you find a sale and fill your cart, then click one of these to get back to their site, it usually gives credit to the final link clicked. But in all honesty – just shop and have a good time, and don’t worry ’bout me. I’m good! And hopefully I’ll be filling my tummy with Grandma Z’s stuffing…I’m making a BIG pan of it this year, and I don’t have to share it! heehee! 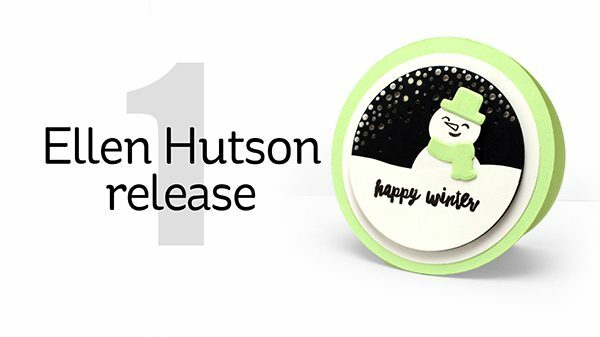 Ellen Hutson – Black Friday: save up to 85% in 2 categories, Clearance and Gratitude (already discounted 15%) PLUS use code gratitude for an EXTRA 25% off. My Favorite Things – til Monday 11/26, get 35% off with code THANKS – there’s also other freebies etc you can find out about on their site. Amazon – if you’re totally stuck and can’t find it elsewhere. Shop the mom and pops wherever you can! Avery Elle through Tuesday 11/27 get up to 70% off Avery Elle’s Last Chance Section. Orders of $40+ get two free rolls of twine. AND! ALL profits from 11/21/18 and 11/22/18 will be donated to various charities for the victims of the California wildfires and Hurricane Michael! Sunny Studio — through 11/26 – All orders will receive a free word die. US orders over $25 get free shipping. 15% of all retail sales will be donated to Convoy of Hope! 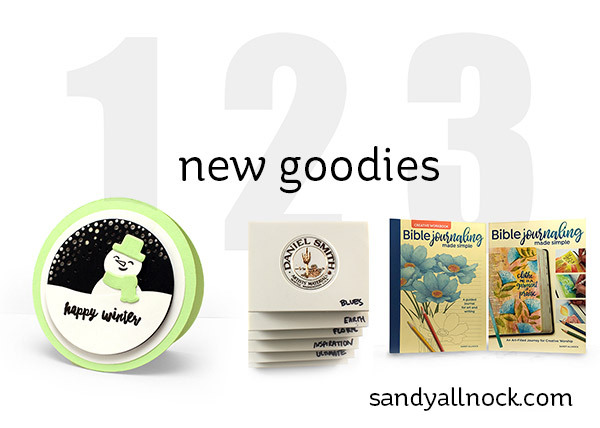 New goodies – for me and you! 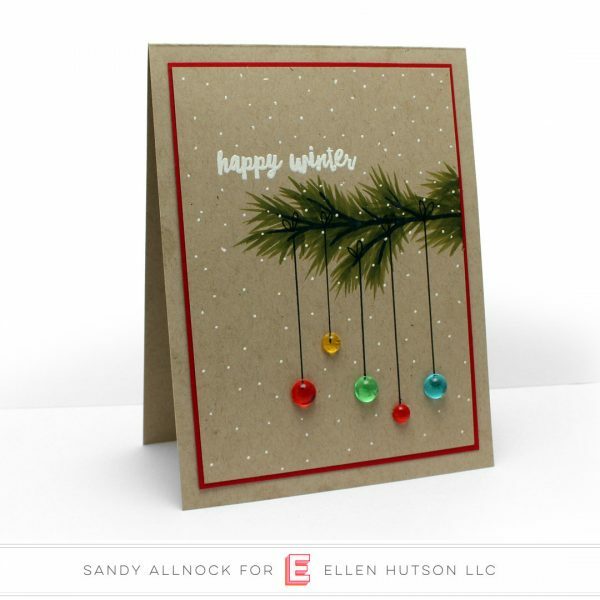 Ellen Hutson release – just showing cards so you can see what the embellies look like in use. 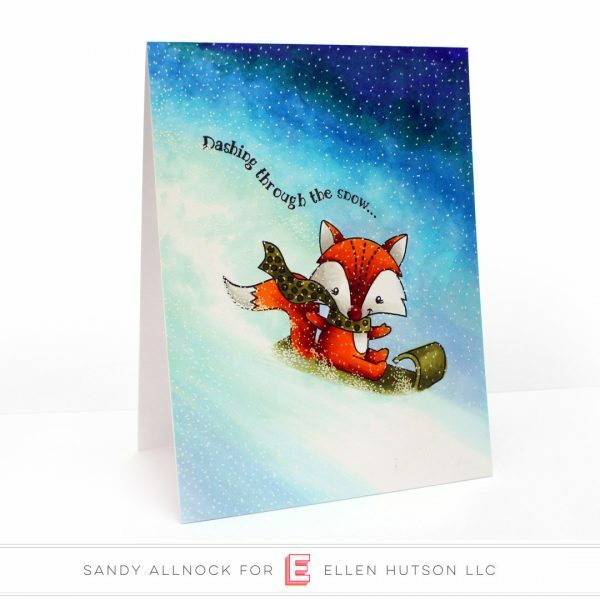 You might have noticed that I don’t usually make samples for Ellen’s site…..we’re very close friends, but I like to just support her without really trying to drive traffic back to my blog with samples all over. 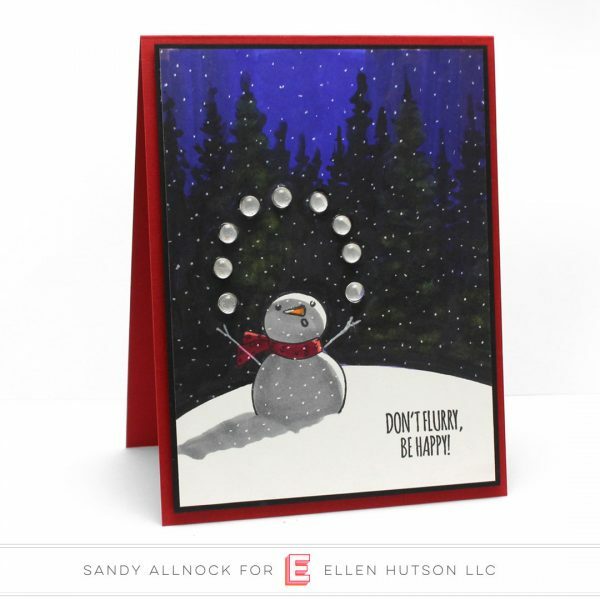 I did ask her if she needed some card samples for the bling, and the look on her face told me yes – she hadn’t gotten these out to the team to do that for her, and so…these cards might end up over in her shop. But the truly HILARIOUS bit in this story: I was there for an hour watching her break little packets of bling into littler packets. I had (stupidly) said I only needed a few of each to pop onto cards, didn’t really need full packs, so she sat there with static electricity causing no end of leaping sequins! Ha! We giggled hard, a much-needed laugh on a Friday…..and now I have a teeny bit of bling I can show YOU. Tee hee! Thistle stamp set (not in this release, it’s an older set) with pine needles added in YG99; Snow Days (sentiment, heat embossed in Hero Arts white powder), Snow added in Uniball gel pen, strings drawn in Copic multiliner pen. Colored Light Droplets adhered with Glossy Accents. Darcie’s Snow Much Joy stamp set, colored in Copic markers. Nose bling is actually called Red Droplets, don’t mind me makin’ up fake crafty news! ha! Snowfall and Snow Buds dies cut from Neenah Desert Storm cardstock; white cardstock added behind. Stamped face from Snow Buds, added hat and scarf from Snow Buds colored in Copics. Snow curve on the bottom is a hand-cut curve. Heart Droplet glued on with Glossy Accents. White on white! Snow Buds stamps and dies. 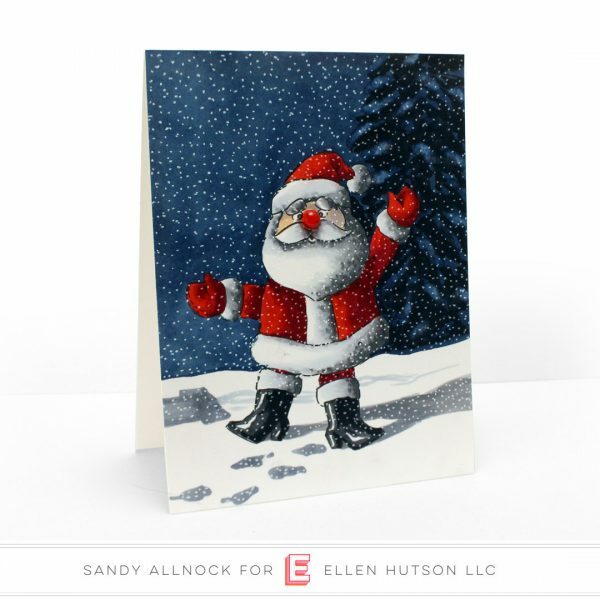 Melted Snowman sequins, glossy accents for adhesive – and texture on scarf and snowline. Snow Buds stamps; added extra snowballs because I stamped the circle too high so I drew in my own. Colored in Copics. Snowball droplets added with glossy accents. Pop Up Mittens without mittens! Using the snowflakes, many sizes are in the set. Sentiment and stripe from Snow Days stamp set. Catherine Pooler inks. Pop Up MIttens die set, diecut from Neenah Cardstock; Snow Days patterns stamped on mittens while not placed into the background. All colored with Copic Markers. Sequins from Snow Flurries mix. Pop Up Mittens die set, watercolored (background sand is painted in Bronzite, a sparkly color!). Pattern from Snow Days stamped and embossed onto painted mittens before adhering them into the background. 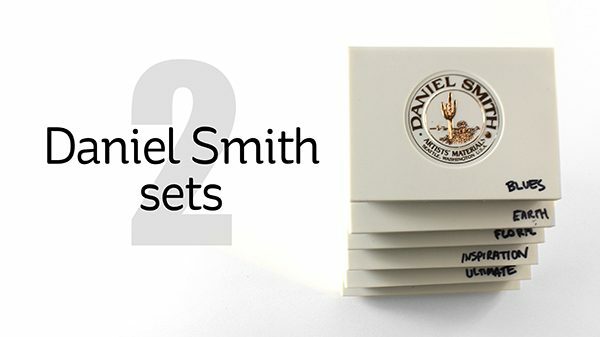 The new Daniel Smith sets are out! I haven’t obviously had time since Friday to do much. But….I do have a plan. What I’d like to offer is, for each set, some suggested additions to that palette. 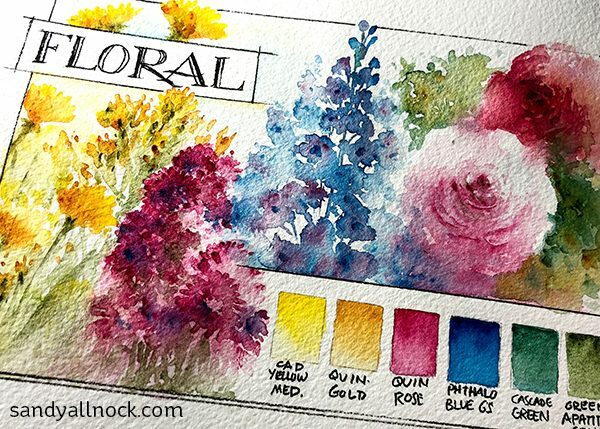 For instance, I really like the 6 colors in the floral set right now – but what is it missing? I’d definitely want a warm red. A sap green. An orange, a deeper yellow maybe, and a warm blue. But I don’t know which ones as yet – but I have lots of time coming for play in the next couple months since I’ll be easing up some in December on videos! To test all that out, I’ll be painting a few things with the 6 provided colors, and then see just what I miss having. And will create samples like this one so everyone can see what can be made from the existing colors in each set. Also – this week’s Bible Journaling video this morning has a technique I discovered recently for stamping without page prep – you’ll love how I did it with no bleeding! Watch it below or click HERE. Glossy Accents – used to adhere all the bling! 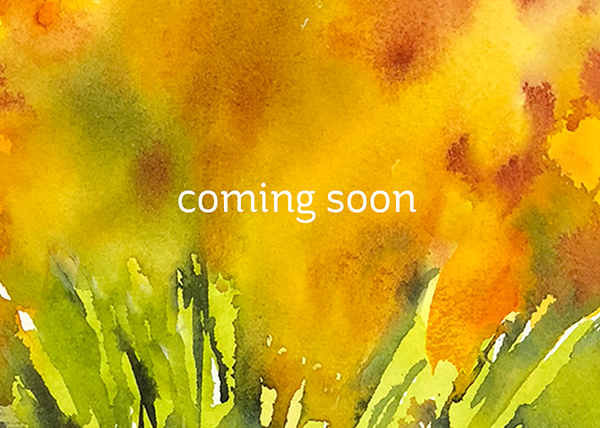 Coming soon – a few heads up! Hello everyone – and happy Sunday! I have a few update-y things today….just for my blog readers.You all are so special, did you know that? Folks who only subscribe on YouTube miss out on stuff when it doesn’t end up in a video! The relaunch of art-classes.com went really well, and students are doing an amazing job with the homework! The requests for help have slowed so I think we’ve stabilized things…and it’s exciting to see so many students tackling their lessons. If you haven’t joined or visited the Student Facebook Group, you really ought to. And post some homework there too – each month there are prizes given out to randomly selected uploaders, to encourage sharing your work! In the spirit of November and leading us toward Thanksgiving, I am offering up a challenge to anyone wishing to take it – posting gratitude daily. It can be photos, drawings, cards, scrapbook pages, typography or calligraphy – whatever you want. It can follow the prompts or just be whatever! I’d love to see everyone out on social media posting beautiful thankful posts, and fill up our feeds with that. With all that’s gone on this past week, so very much hatred and frightening news, we need something positive, and I invite you to join me in being part of the solution! I posted a whole page of the details of the challenge over HERE – feel free to share that page, or copy the images to post yourself on your social media to invite everyone to come join in too! On November 12, it begins! My yearly series of tag videos, in which I give away all the tags! You can see past years’ tags in the full gallery HERE if you want to get started without waiting for the 2018 ideas. It’s early to share this but if I write it, maybe I’ll stick to it? I’m already dreaming of a quasi-sabbatical in December! I’ve needed a respite, so this year, I plan to post…. I may have a few extras to throw in, as I’m part of some online events and releases that aren’t fully nailed down yet. But…a respite will hopefully recharge my batteries and give me time to try things I don’t normally have time to work on – and come back in full swing in January with new inspiration, classes, and lots more fun. 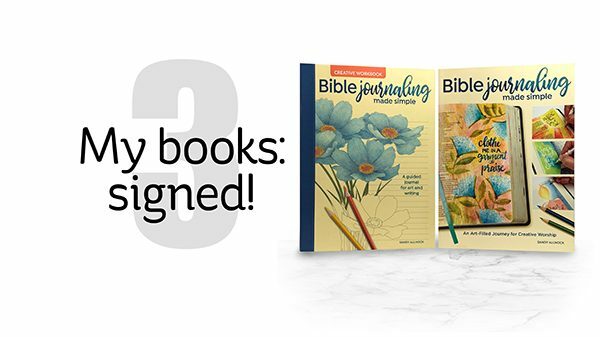 I’ve begun blogging weekly Bible journaling article about a variety of Bible journaling topics. Sometimes it’s general, sometimes I tell the story behind a page created in the past. Sometimes I even use a page that had a video for it and told an additional story! This past week, the Artists Network posted a Bible journaling article I wrote! My Bible Journaling Facebook Group is growing SO fast. Oh my. But what a blessing! Come join us. I have a Bible Journaling YT channel, didja know? Each Sunday I post a video over there, even if I don’t post about it here….This week’s video is below, and you can click on the Subscribe at the end if you’re not already on board. That’s about it for today….as you can see I had a few things bouncing around in my brain that I wanted to at least write down. Whether or not anyone reads them. Ha! Thanks again for being wonderful subscribers, students, and friends! 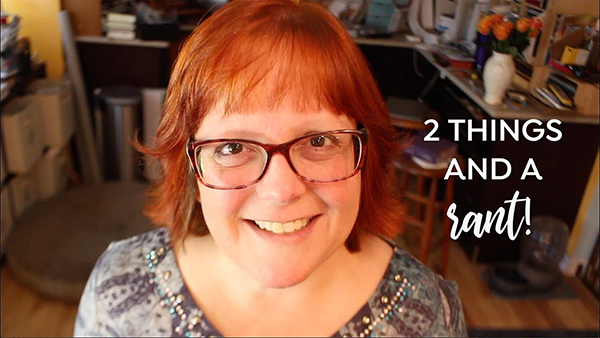 Those who subscribe to this blog probably already know about this…but if you don’t – this is THE time to check it out if you’ve always thought about taking a class but never got around to it. 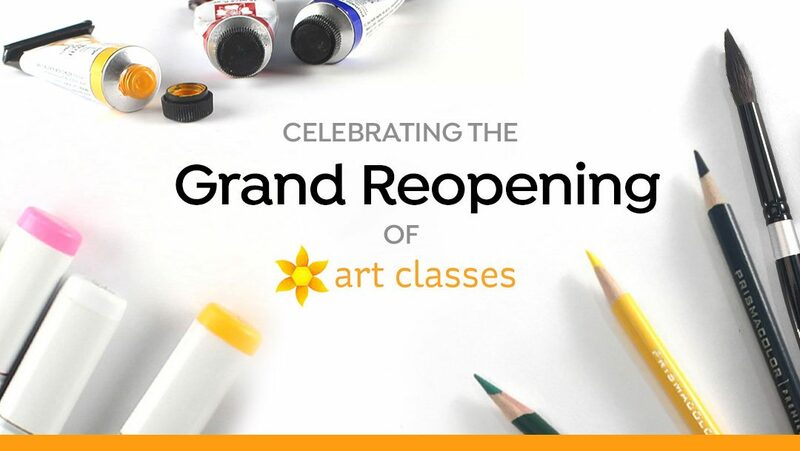 There are discounts and giveaways – one grand prize winner will get access to ALL CURRENT CLASSES! Read more HERE! 2 things and a happy rant! PS a peek at the 3 new classes….and I have a new haircut. lol. Jake Parker has a page about rules but – pretty much anything goes! The whole idea is to draw every day of the 31 days this month. It’s great practice! Don’t worry if you can’t draw – just doodle! Drawing a little something every day helps us grow what skills we do have and that’s always a good thing. Just a plain piece of paper and a pen works! Or markers. Or Sumi ink. Or whatever! Just fill a sketchbook with doodles! If you join in, let’s share our Inktober pieces in the Student Facebook Group – it’s a really encouraging group of fellow travelers on this artistic road. Let’s inspire each other! With the anniversary of the landfall of Hurricane Maria one year ago today, people will be talking more about what’s going on right now in Puerto Rico. Especially in light of Hurricane Florence, too. (Stay tuned for a Florence fundraiser in October!) 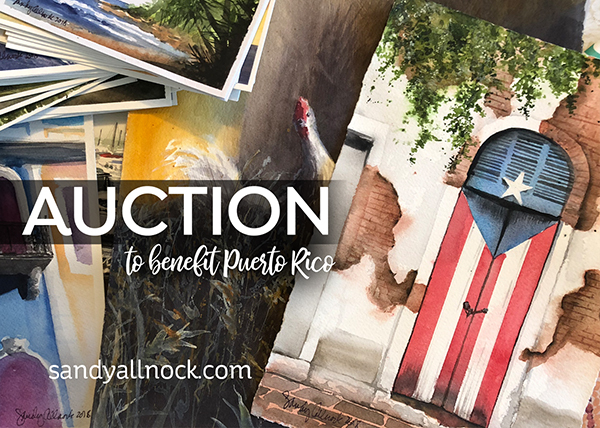 It’s a great time to do a little something to help PR and to share it with your friends and family – and just think, in an auction, YOU get something TOO! GOOD NEWS: Hurricane Isaac dissipated – it was aiming for PR but is falling apart and unlikely to re-form. Hooray! Interested in learning more about the current status of Puerto Rico recover? Check out articles listed below the videos.